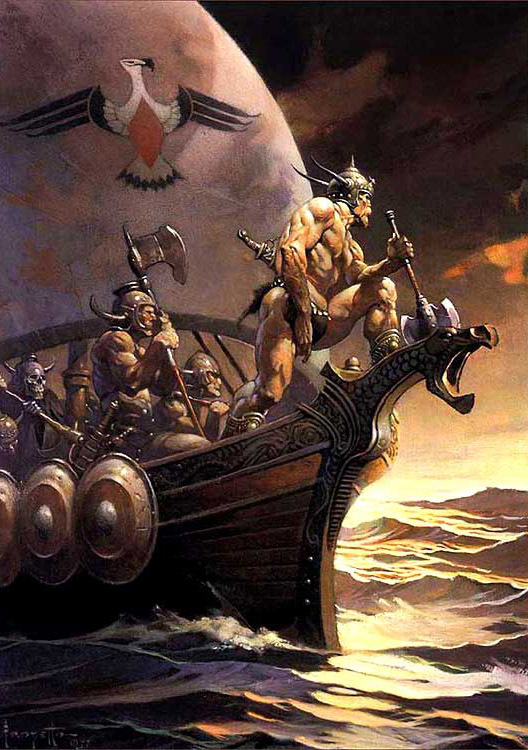 Conan, Ball-room Naval Wargaming, Rubber Dinosaurs, and Galleys ....... If you like the ancient world and its technology, you'll love this ! 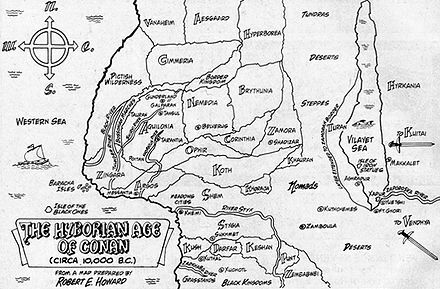 Conan the Barbarian (not the comics, peasant!) was a staple of my teenage years alongside Sven Hazel and Pan Horror books. 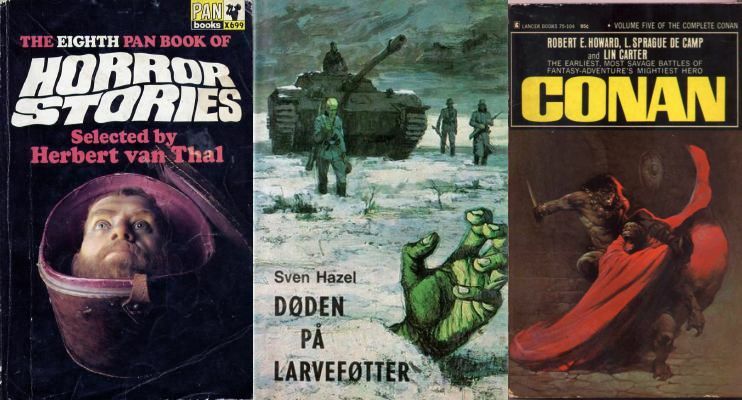 The Conan books are so vivid partly because they are inspired by real historical material repurposed for sword and scorcery. A world with a map and all its population of different tribes, religions and fabulous cities. If you grow up, eventually, you realise the true history of the world is far wierder and more wonderful than any fantasy - just read Herodotos - and eventually you will come to realise the most exotic themes come together around ancient galleys ! When I began wargaming one aspect was modern naval wargaming with 1/3000 scale models. It was easy to make a battlefield and you did not need many pieces. The downside was the game was boring, usually. At that time it was mostly a lot of dice throwing and using many charts to work out your boiler had a small leak. In recent years I found out about a craze that swept the U.S. during the war years for multiplayer naval wargaming which included both men and women playing in ball-rooms ! 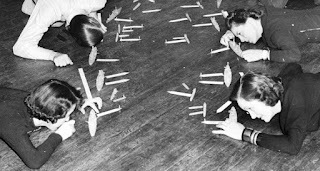 These games used a set of rules devised by one Murray Fletcher-Pratt. The game was mathematical but also fun enough to get people playing it on unused ball-room floors. Fletcher Pratt was keen on all things naval and produced the following impresive list of publications !!! 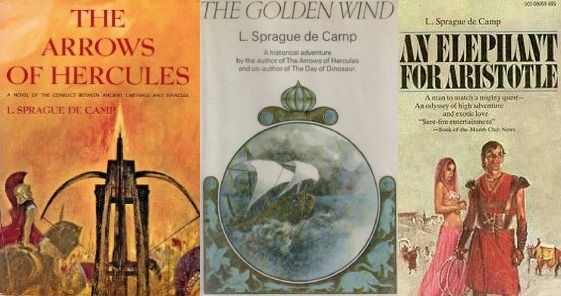 Unfortunately, Fletcher Pratt did not turn his attention to ancient naval matters, but he did start a writers guild, the 'Trapdoor Spiders' in 1944, who produced all kinds of fiction, originally as a way of escaping their wives for a short time! The members of the Trapdoor Spiders were an erudite bunch indeed, Isaac Asimov, Theodore Sturgeon to name but two. Sturgeon, Asimov, Carter AND !!!!!! Lionel Casson !!! Amazingly enough the late, great Lionel Casson was also a member. If you are a galley fan you will know who he is. Lin Carter produced some Conan stories as a 'posthumous' collaboration with Howard Carter by finishing some Hyperboria stories. He did this in collaboration with another Trapdoor Spider, L.Sprague de Camp. This name I knew originally from the covers of paperbacks about Conan. 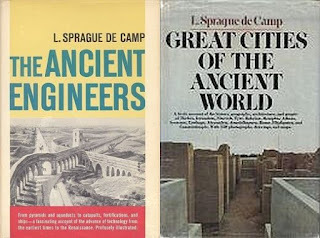 Carter and Sprague de Camp were greatly interested in historical themes as well as writing. 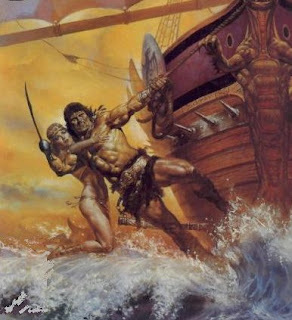 They collaborated well in completing and extending Robert Howard's oeuvre. Sprague de Camp was just as polymath and interesting as the other Trapdoor Spiders. 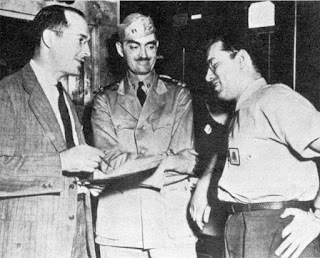 He was a scientist, working in aeronautical engineering, but also interested in history. Galleys are ancient technology and so it was inevitable that he should eventually focus his attention on our favourite topic. He wrote popular science books such as explanations of evolution and energy and power. 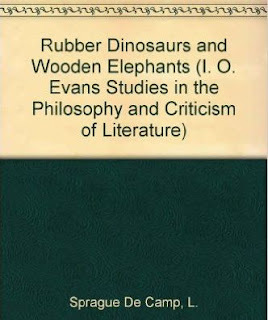 One of the most memorable titles is 'Rubber Dinosaurs and Wooden Elephants - a collection of mind boggling essays that jump over a plethora of subjects which reminds me of James Burke's 'Connections' series but more entertaining. 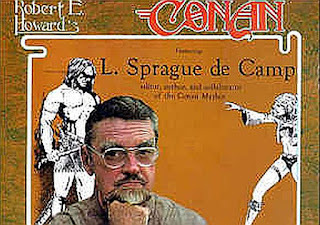 More directly, getting down to galleys, my first contact with Sprague de Camp's ancient history fiction was a book I did not realise was by the same bloke writing Conan stuff. 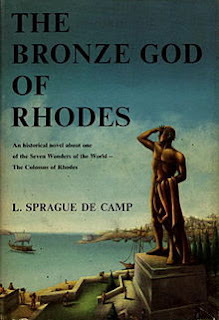 This was 'The Bronze God of Rhodes' . This is a great read with a lot of ancient history and technology in a 'rip-roaring' tale. One cannot take these books too seriously but they are atmospheric and entertaining as well as including informative factual material. Indeed, the eccentric symposium members in this book are said to have been modelled on the Trapdoor Spiders ! (who is who ?). 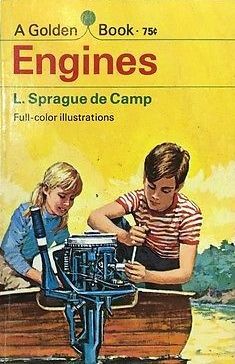 I did not realise until recently how many of this genre Sprague de Camp produced. They are a real mine of information and ideas - some now outdated - but always entertaining. These books are a great antidote to getting bored slogging through factual material. The can give your interest a reviving kick and if a gamer then provide nice ideas for situations and scenarios. The Arrows of Hercules is about inventing catapults in Dionysian Sicily. The Golden wind is the real sailing one ! About navigating to India and back ! The Elephant for Aristotle is about transporting an elephant from Alexander in India to Athens! Along with the fiction there is also some great reading about ancient technology. 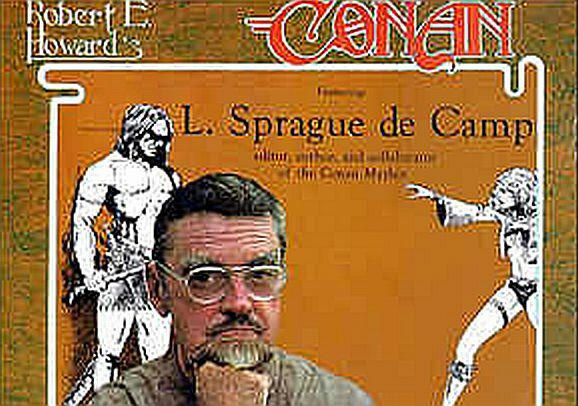 Some now a little dated but Sprague de Camp was such an entertaining writer they are still worth a go. So, maybe I was doomed from early on to end up interested in ancient galleys. The trail from Conan to pentekonter was inevitable. But following that trail backwards is also interesting when it hits on such a crazy and fertile set of collaborations. Sprague de Camp, Heinlein and Asimov !